This was the first post we wrote in the 'Plant of the Month' series in 2012. The garden has matured a lot since then. The seeds from the original lupines have spread, giving us a bright show every year about this time. We've added a few photographs to inspire you to grow this delightful annual in your own garden. Arroyo Lupine is an annual wildflower in much of western California, parts of Arizona and Baja California. It’s a lowland plant, usually growing in open places, coastal prairies and grasslands below 2000 ft. elevation. It used to grow extensively in the Gardena area and still can be found in the Preserve. Like many annual wildflowers, Arroyo Lupine was not seen every year. But in years with the right rainfall, our roadsides, fields and open areas were once covered with native lupines. 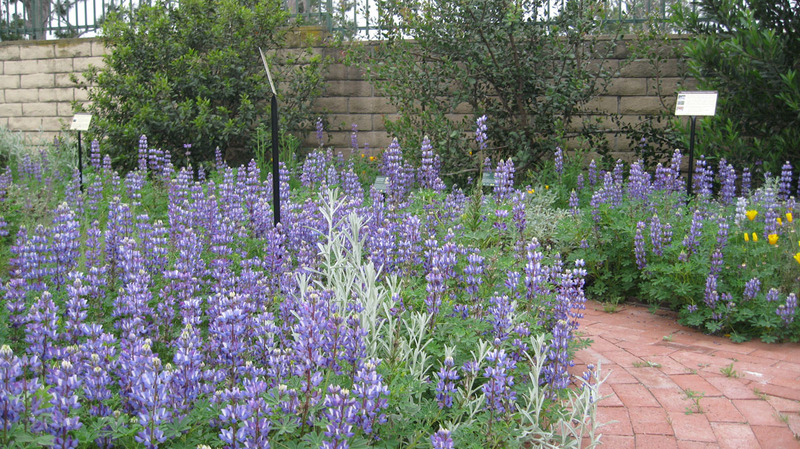 Arroyo Lupine is the largest of our native annual lupines. Like all annuals, it completes its entire life cycle in less than a year. 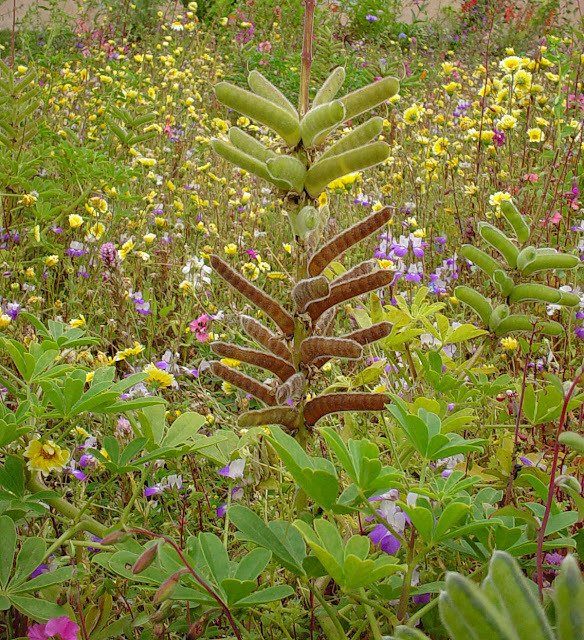 In most years, Arroyo Lupine will sprout from seed in winter (December to February) and then grow rapidly into a fleshy plant that is 1-2 ft. tall and wide. The plants normally flower for about a month, usually in March or April in our area. Once the seeds mature (in May or June) the plant dies and the cycle is complete. 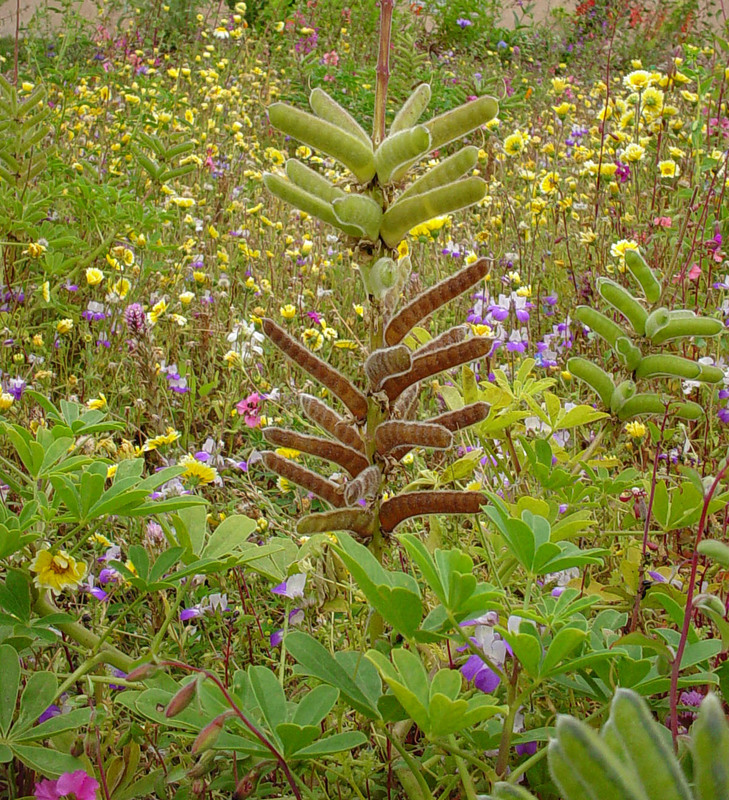 The bright green leaves of Arroyo Lupine are ‘compound’, composed of several leaflets. The leaf shape is called ‘palmate’ because the leaf looks like an open hand. 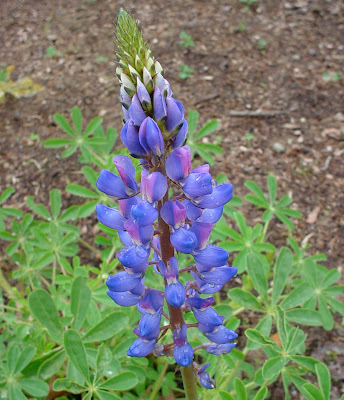 This leaf shape is shared with other lupines and, along with the flowers, is a distinguishing characteristic of the lupines. The leaves are designed to trap water and channel it down to the soil. On a foggy day you will notice water droplets gathering on the leaves. These droplets run down the leaves and into the ground, providing water to the roots. The leaves are eaten by the caterpillars of several butterflies such as the Painted Lady, West Coast Lady and Common Sulfur, so Arroyo Lupines attract butterflies to the garden. Note pink color of pollinated flowers. 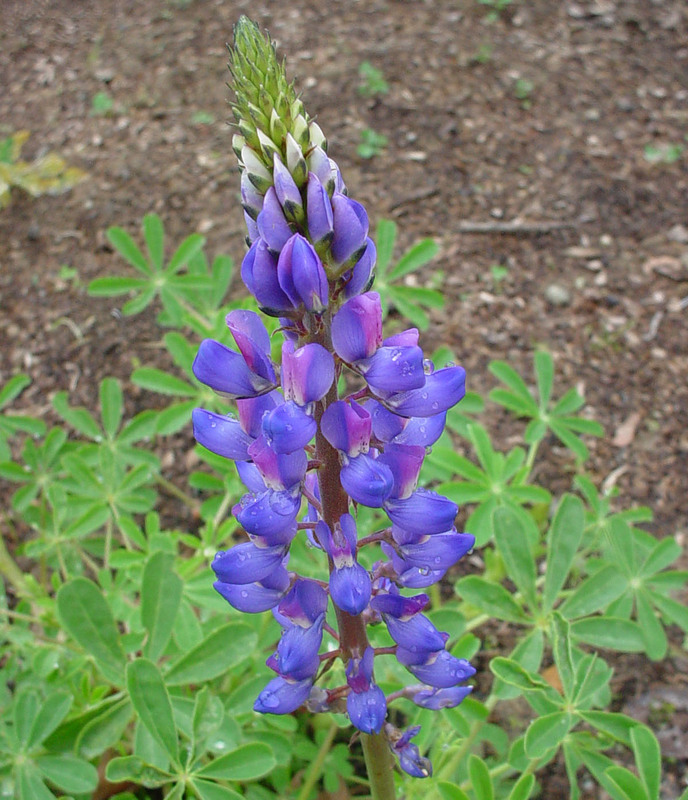 Arroyo Lupine, like all lupines, is a member of the Pea Family. The flowers are densely spaced on flowering stalks that grow above the foliage to attract pollinators. The flowers are a bright blue-purple with a white dot. If you look at the individual flowers, you will see the similarity to Sweet Peas and garden peas – all of which are in the Pea Family. 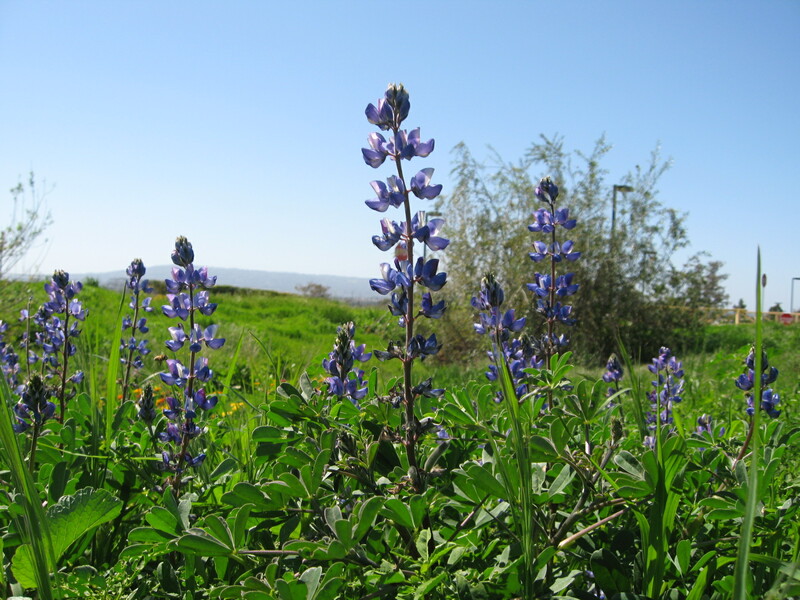 Arroyo Lupine flowers are pollinated by bees (often the larger bees) and occasionally by hummingbirds. You can tell if a flower has been pollinated because it changes from blue-purple to a pink-purple color. 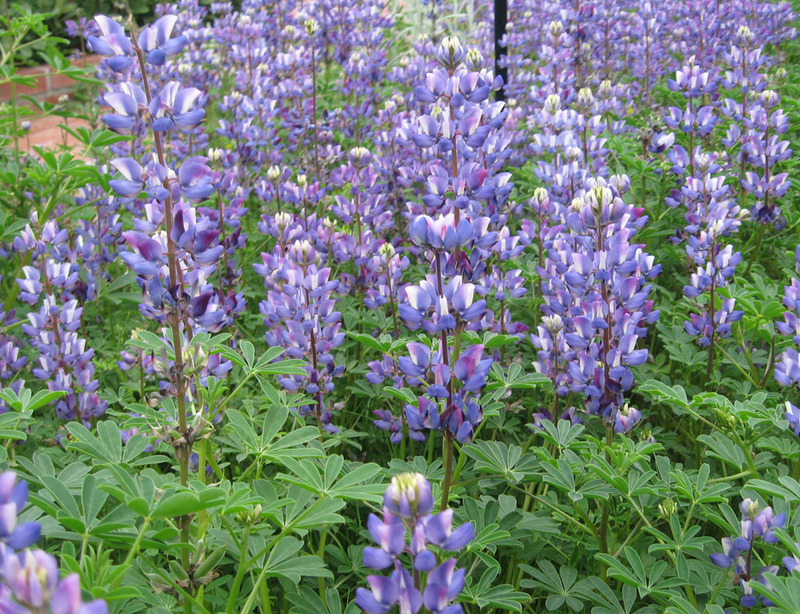 Lupines improve the fertility of the soils in which they grow. Many members of the pea family have a unique relationship with special soil bacteria. These bacteria live within nodules in the roots and convert nitrogen into a form that can be used by plants. When the plant dies, the converted nitrogen is released into the soil, improving the soil fertility. 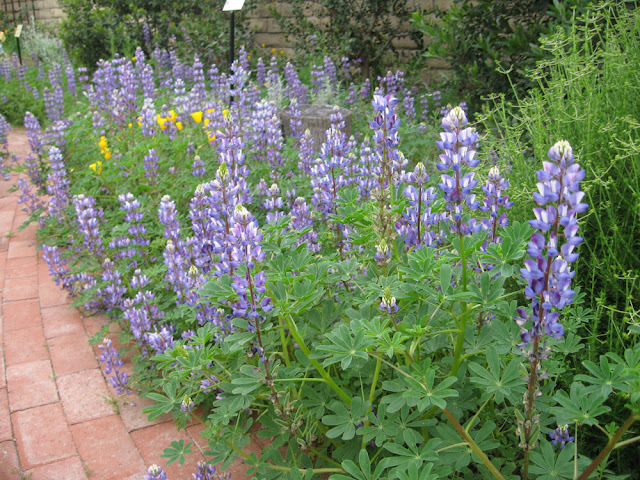 Native annual wildflowers like Lupinus succulentus grow best if they are seeded directly into the ground. Because we planted our garden in late February, we raised our plants in pots before we planted them in the ground. Most wildflowers have delicate roots and don’t like being replanted. So next year, we’ll plant our seeds directly in the ground. Growing annual lupines is quite easy. Spread the seeds on prepared ground in early winter (right before a good rain storm) and rake the seeds in lightly. Then watch for the seedlings to emerge in the next few weeks (see photo). If the weather turns hot and dry, you may need to water the seedlings to keep them alive. Plants need regular rain/watering until they have flowered. In most years, rainwater will supply all the water needed, since the roots can reach down as much as 3 ft. Once flowering is done, the soil needs to dry out. This allows the seeds to mature – including the last stage of drying out. If you continue to water, you’ll not get a good seed crop. Lupine seeds grow in seed pods along the stalk. When the pods are dry, they twist open with a ‘pop’ showering the seeds across an area several feet wide. These seeds will become next year’s plants, if they aren’t eaten by doves and other ground-dwelling creatures. If you want to save Arroyo Lupine seeds, you’ll need to collect the pods when they are almost dry (they will start to turn brown & look dry). Place the pods in a paper bag and seal it securely; then place the bag in a cool, dry place. Don’t be surprised if you hear the pods ‘explode’ within the bag. Arroyo Lupines can be grown in the ground or in large pots. 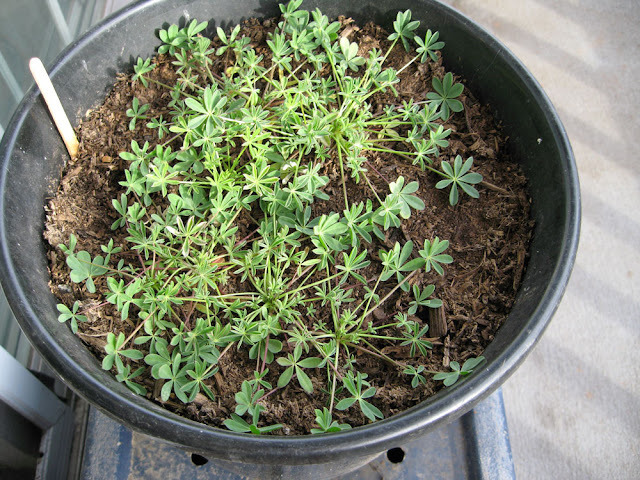 In fact, we suggest growing your first lupines in pots. This allows you to understand the plant’s stages better and to collect seeds easily. A pot of lupines blooming on a sunny deck or patio is a heart-warming sight! throughout Mother Nature's Backyard garden. The only drawback to growing lupines is that all parts of the plant are toxic (poisonous). People and pets should never eat the leaves, stems, seeds or roots. It should be noted that many common plants whose parts are poisonous are routinely grown in home gardens. These include daffodils, Iris, Angel’s Trumpet, Azaleas, Calla Lily, Columbines, Foxgloves, Plumeria, Privet and common ivy. Water-wise Gardening: Do I have to plant cactus? install artificial turf? Many people are interested in decreasing their water use. Since about 60% of home water is actually used outside the home (mostly to water plants), the garden is a logical place to save water. Our main purpose – in our garden and on this blog – is to share ideas about making your garden more water-wise and life-friendly. And we plan to do this over the coming years. 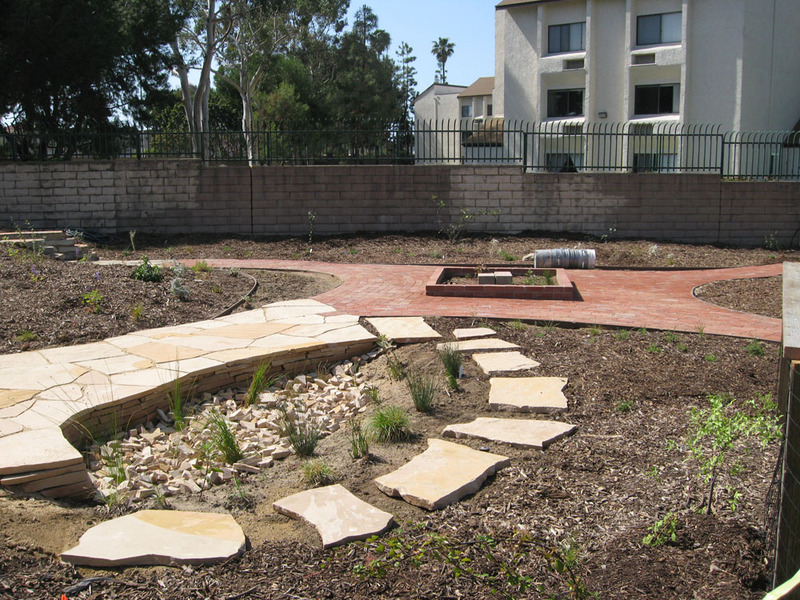 But first, let’s consider some common misconceptions about water-wise gardening. 1. Do I have to plant cactus? Unless you really love cacti, the answer is no. Contrary to what some people say, we don’t really live in a desert in western L.A. County. Desert areas get extremely low rainfall – often less than 5-6 inches per year – while we get an average of 10-15 inches. Our climate is dry, but it’s still moist compared to true deserts. In fact, you’ll need some garden tricks grow cacti in your garden – we just get too much rain! People who live in Barstow, Phoenix or Las Vegas do live in the desert, so cacti and other desert plants are appropriate for their yards. 2. Should I consider installing artificial turf? At first glance this seems like a good way to save water. But you might like other options even better. Artificial turf can get hot and you’ll have to wash it down when it gets dusty and dirty. In addition, artificial turf will not attract birds and butterflies; and it can’t compete with real grass for kids to play on. Water-wise native grasses, groundcovers and other plants are usually more attractive and ‘life-friendly’ than artificial turf. 3. Should I just pave over my yard? While pavement is a good choice for some uses – like driveways – there are more attractive options for your yard as a whole. Most people are happiest with a combination of plants and hardscape (the non-planted areas of a garden like patios, walkways, etc.). Come to Mother Nature’s Backyard to see some attractive gardening ideas that combine plants and hardscape.. We’ll even show you how to make your hardscape water-wise (by allowing rainwater to percolate into the soil instead of running off into the street). 4. Do I have to get rid of my lawn? This is not an easy question to answer. Lawns do need water. But they also are wonderful places for children to play and pets to romp. So you need to consider how you actually use your lawn areas. If the kids need a place to play, keep the lawn and save water in other areas of the yard. If you don’t really use your lawn, consider making it smaller or replacing it with water-wise alternatives. 5. Do I have to get rid of all the plants I love and replace them with water-wise plants? The short answer is ‘no’. Think of your home’s water in terms of a ‘water budget’. You have just so much water to spend, but you can spend it however you choose. If you choose to spend more water on a vegetable garden, then you’ll need to spend less on other parts of the yard. If you love roses or want to keep a lawn in your front yard, then you’ll want to balance these with a combination of water-wise plants and hardscape in your backyard, etc. 6. 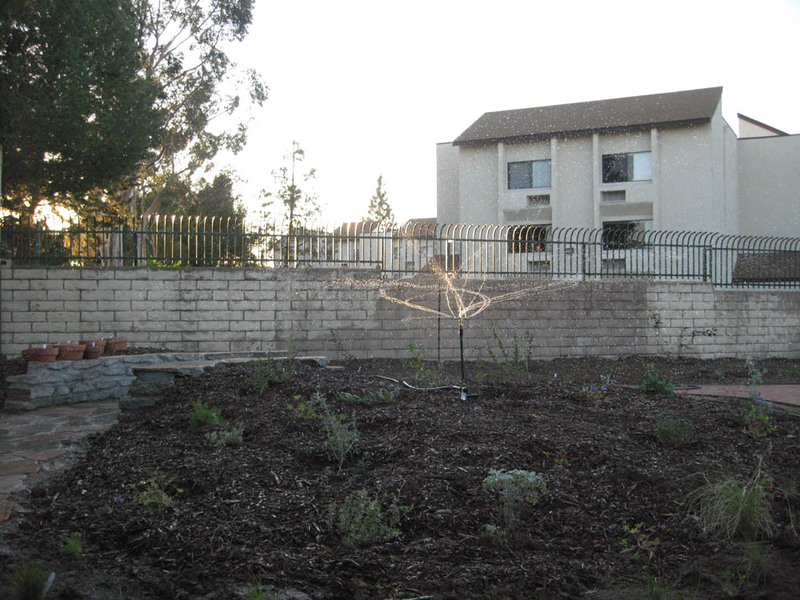 Do water-wise gardens have to be ugly? Once again, the answer is no. Water-wise gardens do look different from many of today’s gardens, but they can be even more interesting and beautiful once you get used to them. Traditionally, we’ve borrowed plants from the tropics and other rainy places for our gardens. These borrowed plants require plenty of water and fertilizer - they do hail from rainy places, after all. Water-wise native plants come from our own mediterranean climate, so they need less water and fertilizer. Some are dormant in the summer, but a number are evergreen. And many are beautiful, interesting and more life-friendly than the plants in traditional California gardens. We hope these answers will get you thinking about your garden in new and exciting ways. In our next post we’ll consider the topic of Water Zone Gardening, a great way to make the most of your water. Those of us who garden with California native plants notice an increase in wildlife visitors almost immediately. Some plants attract butterflies, others are magnets for native pollinators and still others are filled with birds. We're compiling a list of the best California native plants for attracting wildlife to western Los Angeles county gardens. Since we have less experience with cultivars, we especially need your help in identifying native plant cultivars that are 'wildlife magnets'. 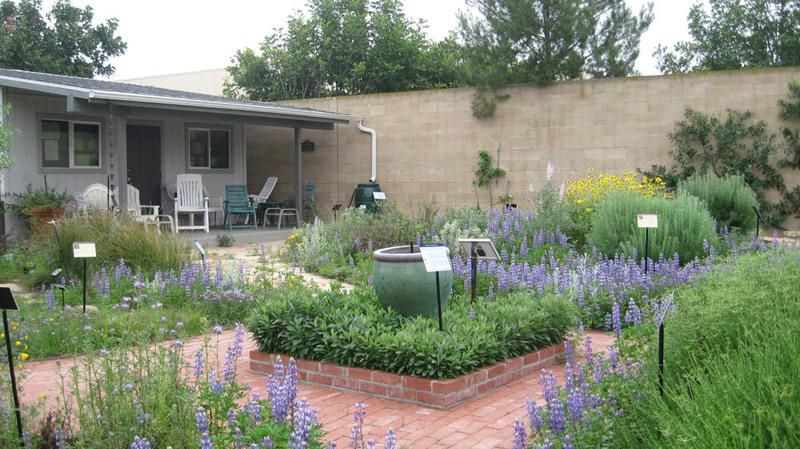 But we're interested in all recommendations on good California native habitat plants for local gardens. Please share your experiences by posting a comment to this post. List the species and cultivar name(s) and note the kinds of wildlife it attracts to your garden. Feel free to list as many species/cultivars as you wish. We will use your feedback to update our list. The complete list will be posted on this blog later this spring. One of the benefits of living in Southern California is not having to water during winter. In many years, rain supplies most/all of our garden needs from November or December until April. But this year (2011-12) is not a usual year. La Nina conditions have produced a winter with very little rain. And the rains we’ve gotten have been widely spaced – with plenty of warm windy weather in between. In short, our soils are very dry for this time of year. The mediterranean climate in Gardena CA is characterized by relatively mild, rainy winters and a long dry summer/fall. Our climate is a result of our location - near 35º N latitude and on the western coast of North America. Prevailing winds blow off the ocean in winter/spring and from the dry lands to the east in summer/fall. We share a mediterranean climate with several other parts of the world - the Mediterranean region itself, the South African Cape, the west/south coast of Australia and central coastal Chile. All share a similar geographic location; their plants show similarities as well. Southern California’s native plants have a number of strategies to cope with long dry periods (more on that topic in the coming months). But local native plants – even those that need no summer water – rely on adequate winter rains. Winter is the time that many native plants grow, develop deeper roots and obtain needed nutrients from the soil. All this requires moist soils. And if Mother Nature doesn’t provide, then we need to supply the water ourselves (unless we prefer to let nature take its course). In Mother Nature’s Garden, we’re watching the weather forecast closely and watering our newly installed garden. Many native plant gardeners have questions about winter watering. Since we often have dry periods – even in a normal winter – it can be difficult to know when/how much to water. A good rule of thumb is to check your soils if we’ve had 3 weeks of dry winter weather. Even though plants appear vigorous, their supply of soil water may be getting low. Dig down 3-4 inches into the soil to check. Be sure to clear away the mulch and dig down into the soil itself. If the soil is dry at the 4 inch depth, it’s time to water. The best time to water is on a cool cloudy day, imitating Mother Nature. Check your weather forecast to choose an appropriate day. Then water either in the early morning or late afternoon/evening – both are times when winter rains would normally fall. If your garden has drip irrigation or soaker hoses you can easily provide a slow supply of water that can infiltrate the soil. If you’re watering with overhead sprinklers or with a hose/sprinkler, you may need to break up your watering into several sessions to allow the water to soak in. In general, you want to supply water at a slow rate over a long enough period to replenish the soil. The length of time will depend on your soil characteristics. The only way you’ll know if your soil is moist (but not soggy) is by digging down and checking. While watering your native plants in a dry winter may seem wasteful, remember this: giving your plants adequate water now will allow them to survive the coming dry summer, when water will really be in short supply. If you still have qualms about winter watering, you can choose not to water – the choice is yours. The hardiest mature plants will likely survive, just as they do in nature. Your garden will most likely change, but change is a fact of life – both in nature and in our gardens.